Designed and delivered brand identity assets including Capabilities Deck, marketing collateral and Visual ID Board for consumer research consultancy Sprout Insight. 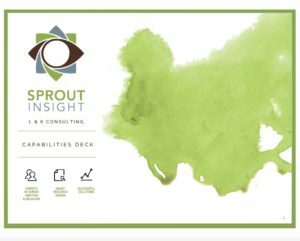 Provided innovation strategy to help distinguish Sprout Insight from other consumer research companies. Collaborated with Becoming Brands Founder Sheila Lewis.